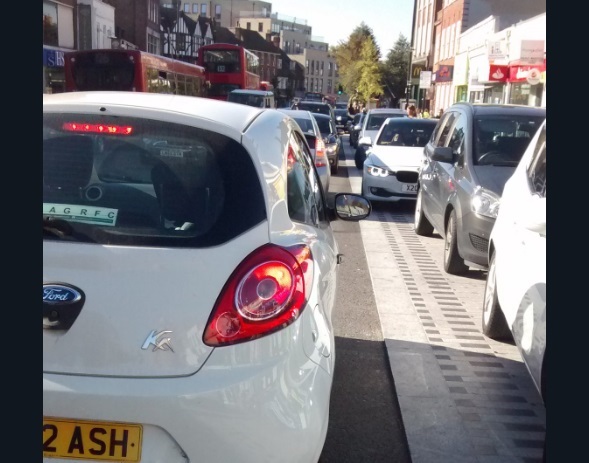 It’s barely a year since Greenwich Council’s £6.5 million upgrade of Eltham High Street completed – with the vast majority of funds being given by TfL. And it’s falling apart in places. 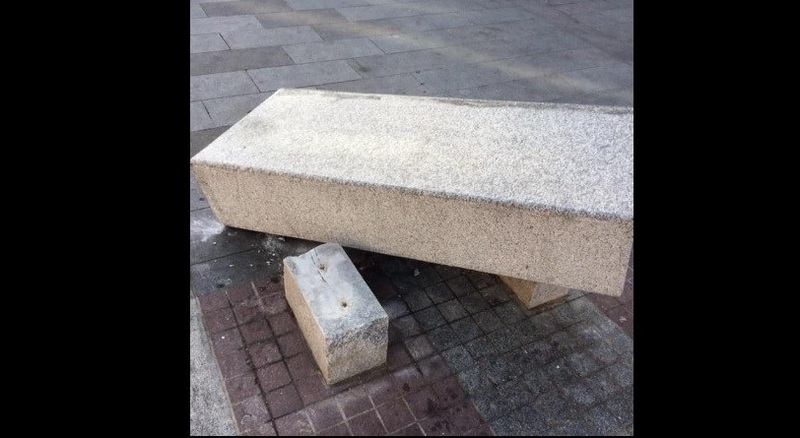 Since completion of the scheme, enforcement of illegal parking by Greenwich has been predictably non-existent much of the time – meaning a newly pedestrianised section on Passey Place is often a car park with granite street furniture damaged by vehicles. Those granite seats cost a few bob each. Whether they will fix them or ditch given costs will be seen. Pedestrianised areas or car parks? The authority this week announced they had issued the most tickets ever in one week – though it’s a low bar. Many cars were still seen parked on paving this week in Eltham town centre. People have been reporting the issue ever since work completed. Weekends are often bad – it’ll be interesting to see how it is over the coming two days. Residents are continually raising the issue to apparently no avail. 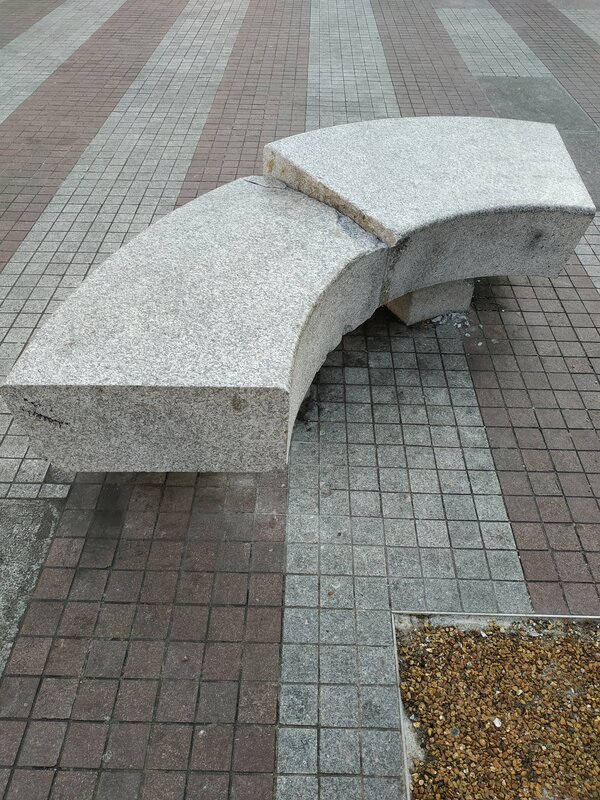 The newly pedestrianised area is not a place to sit down and relax. Most times I visit I witness double parking and cars on pavements. TfL must love how Greenwich treasure the investment money given to them. If it’s not £6.5 million here it’s the £1.2 million street upgrade from Plumstead to Woolwich which has seen 130 bus drivers signing a petition threatening to not call at bus stops given continual dangerous parking. Greenwich complain that TfL are not funding some schemes in the borough (which are badly needed) yet TfL may argue why should they bother giving funds if Greenwich simply let places rot after money spent. Especially now given TfL are now seeing cuts and budget issues. The authority have now hired 10 agency wardens – though problems still persist. It’s odd how they managed to hire so many after saying for so long they couldn’t find staff. To be fair the Cabinet member has said they may look into more and noted just how few were employed when she took over the post. The council were also one of just three (as of 2017) in London never to have sought authorisation to use CCTV against driving offences. They are belatedly now doing so. Still, when you’ve got at least a £10 million parking budget hole over the past six years what’s the rush? Why not just raid funds for health, education and other areas to cover it? This year it’s around £1.4 million. That money was budgeted to pay for concessionary passes for pensioners. The shortfall had to be found elsewhere. Some have complained that it’s hard to see where parking spots are now located as kerbs removed. 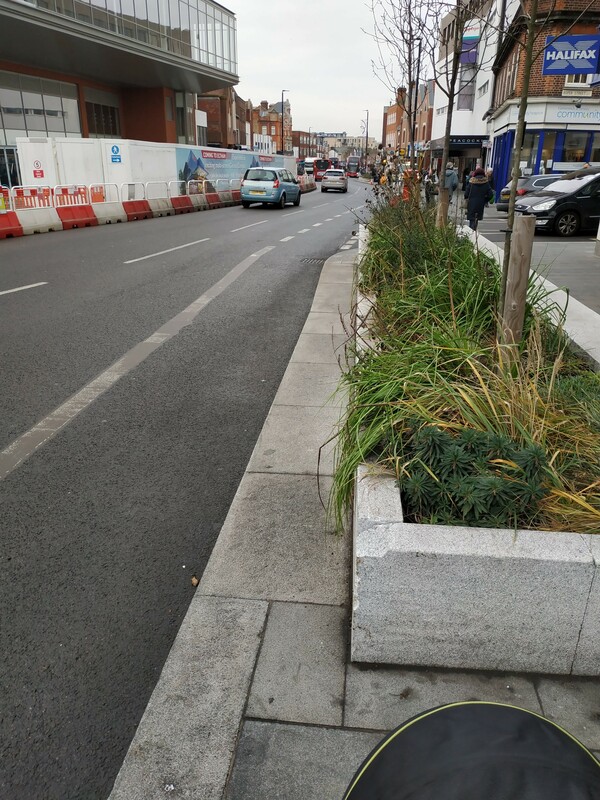 Whilst I have reservations about the scheme and certain details such as no kerb – it’s very little to have sympathy with that argument and if driver’s eyes are good enough to be on the road they can see the demarcation lines. It’s hardly a revolutionary scheme – similar exists across London and the country. It’s only new if you never leave this corner of London. I’ve not noticed anywhere near the same issues at other areas with similar designs. The difference is enforcement levels. And on that note a post soon will look at how a lack of parking income and budget issues is causing problems compared to other London authorities. Ultimately it goes much further than parking – all areas suffer as budgets are a mess. There is also now a From The Murky Depths Facebook page. Click here to follow and see stories on your Facebook feed. Eltham is just another in a long, long list where parking is terrible and pedestrians ignored. Woolwich – near the councils own HQ!!! I don’t see why illegal parkers cannot be prosecuted by way of a simple photo of them in the act. I hope the above red Peugeot EJ59E FVB was fined and given points in their license. The council should institute a scheme where registered photographers could simply take a picture of an illegally parked vehicle, that picture would automatically download onto the council web page and a bill be sent to the offender. The photographer could even be paid from the proceeds. The council might need to pass a bylaw (can’t imagine anyone objecting). Drivers only do this because they think they will not be caught by a traffic warden as they are so few and far between. If the council instituted a ‘photo, bill and points’ system it would stop this almost overnight with hardly any outlay for the council (a few ‘You are in a photo monitoring area’ signs). Driving in Eltham high street, and trying to fine a legal place to park is so horrendous now that I don’t bother to go there a time all. Yes the design of the scheme could have been better, the choice of the materials could have been better, but the biggest issue at the high street has been lack of parking enforcement and people not appreciating their own local area. I regularly drive through Eltham, and before the regeneration was started, the plans made it seem as though it would be really appealing once finsihed. I personally think the town has been ruined though. It had a quaintness to it before, it seemed friendly, traffic flowed relatively calmly, people stopped and talked. Now though it feels cold and harsh, hostile and unfriendly to visit and dangerous to drive through. The old pavements with traditional paving slabs would have been as dirty as the new bright ones, but they looked cleaner because they were darker. The kerb stones, were old and worn at the edges, which gave them an old traditional but homely feel. The new ones are squared off to a sharp point that would gouge a hole in a person if they were to fall and catch themself on one. There was a slight problem with double parking before, but nothing compared to how it is now. The double parking forces vehicles into the middle of the road more, but then you have to contend with people coming the opposite way, that are venturing over to your side of the road due to lack of line markings down the middle of the road. The traffic island by the church has done nothing but cause bigger queues at the lights due to the right hand lane being almost unusable if traffic is queueing back to the island. This creates frustration and is more likely to lead to chances being taken once people do get past it, and they will use the wrong side of it, venturing into oncoming traffic if they have to, by going the wrong side of the island. I’m surprised loads of accidents haven’t happened as a result of this island. The island further back, by the petrol station has created pinch points, due to its placing and the parking spots that are adjacent to the newly created, but hardly used cycle lane. For the average sized car, it just becomes a bit of a slalom navigating that island, but for buses, lorries, fire engines ect, it really has forced them to take it very slowly and carefully through the gap, especially if overly wide vehicles are parked in the parking bays. If you are driving up the hill and turning left into the petrol station, and large vehicles are parked in the bays just before the entrance, then any cyclist using that particular bit of cycle lane wouldn’t be visible until very late in the manoeuvre. Pulling left out of the petrol station needs more care now. 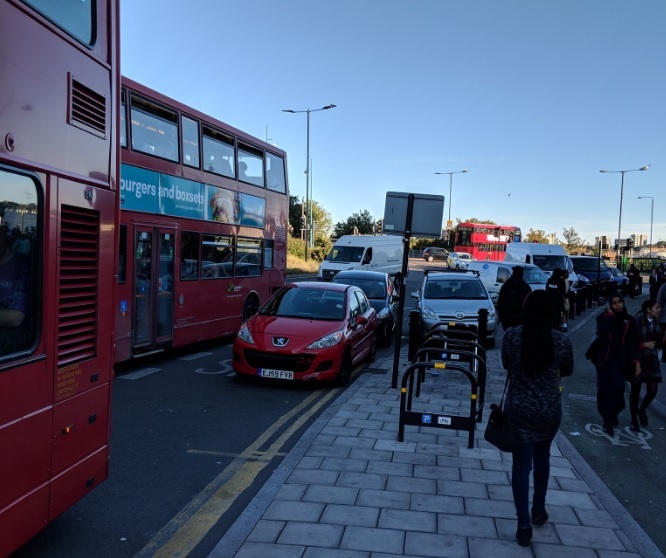 Again, because of the cycle lane and parking bays right by the exit, if you are in anything slightly larger than the average car, then the nose of the vehicle will protrude into traffic flowing down the hill. Passey Place is now an eyesore. Argos is practically impossible to buy large items from now (better off going to Thamesmead that has ample parking close by). Going to Eltham Grill for fish and chips means you have to now possibly park in North Park or Sainsburys car park, meaning extra walking to your car, and thus colder food on arriving home. Basically this once nice little town that had so much to offer, is best avoided now. Drive through it at your own peril but don’t stop. Just keep driving until you get to somewhere far more welcoming, even if that means driving to Thamesmead, Bluewater or even Thurrock. I am surprised Greenwich Council have not got Parking Enforcement Officers patrolling the area 7 days a week issuing tickets to motorist to get much needed funds for the cash strapped Council. Parking in the area is set to get worse when the new Cinema opens later this year.